For the full story about my weight loss journey, please read….Okay, so it’s not a tumor. I’m really happy this morning and still confident that this is a life style change and not a diet. If there’s one thing I’m not happy about, it’s not being able to get in as much exercise I did the last time I tried to lose weight. I walked the girls to school every morning and picked them up in the afternoon. On my way home from dropping them off in the morning, I’d time myself and try to get home faster and faster every day to improve on the previous time. I keep wondering how much faster this weight would come off if I could do that again but the hernia makes me worried about walking so far and my heel is still very painful. I don’t want to make that worse because I don’t think I could stand it hurting more. I have to stop myself from crying sometimes when it gets really bad. I’m hoping that as the weight comes off, I’ll be able to get more active. I need to speak to my doctor about the kind of exercises I can do safely that won’t put my hernia at risk. I’m still going strong, my willpower is holding out and I’m not snacking between meals. I’m missing my snacks in the evening if I’m honest but the other day I had a scare which helped keep me on track the rest of the week. I suddenly got a pain in the area where I can feel the hernia and had to go lie down on the bed. It was really scary and I thought I was going to end up having to call an ambulance and enduring an emergency operation. The pain did eventually go and for the next few days I took it easy. To be honest, I was scared to move much in case it started hurting again but I’ve been fine all week. I’ve got a Tesco delivery coming today and for tonight’s treat I’m having some Walkers Sensations crisps, some dip and some ice cream. It’s funny how much I’m looking forward to having a snack tonight while watching tv with Ant! I’m really pleased because it’s proof that I can lose weight without having to count every calorie. I’m keeping my portions down and not snacking as much in the evenings. Another loss means I can have my Friday night treat and I think pizza followed by cake and custard is on the menu for tonight. I’ll hopefully, if I remember be back with photos tomorrow! 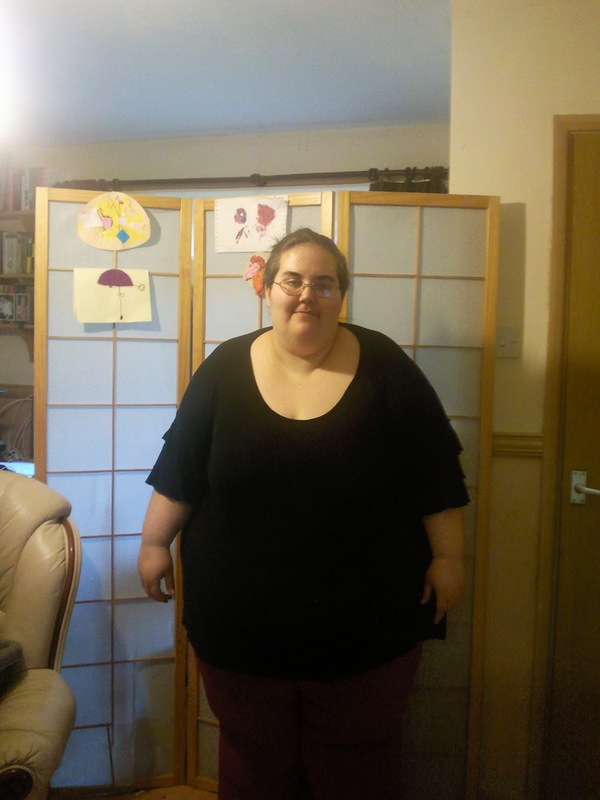 If you’ve read my post….Okay, so it’s not a tumor, you’ll know that I have to lose a lot of weight to be able to have an operation to sort out a hernia. I’m back to 28st 12lb so now I can work on getting rid of my first stone. I’m really pleased, especially I’ve not been tracking my calories this week. By not tracking, I mean I haven’t been logging everything I eat at Sparkpeople but I have been keeping a mental track and making sure I keep my portion sizes down and my snacks reasonably healthy! I’ve failed before, many times because I get fed up of having to weigh everything and write it all down. I can’t live like that forever and I need to permanently change my eating habits so I need to be able to rely on my will power to not have food when I’m not hungry, keep my portion sizes down and eat less junk and more fruit and veg. My weight loss this week means I can have my Friday night treat and I’ve ordered a Chinese takeaway from ASDA with the delivery I’m getting today. It’s so much cheaper than getting one from a Chinese restaurant and I’m really looking forward to it; it’s been ages since we’ve had Chinese takeaway. Well we had a wonderful week at Butlins and I have some ready to publish once I’ve added all the photos so I’ll be back with those later. This morning though, it’s all about my diet over the last week. We had quite a few takeaways during the week but I was determined not to get out of control. For instance, when we went to Burger King, I had a child size meal instead of a super sized adult meal. I did have a few treats during the week; the caramel coffee from Soho Coffee Co. was delicious, as were the fresh prawns and hot doughnuts but my favourite indulgence came in the form of a pear drop milkshake from the shake place in the Skyline Pavilion. Ant fetched it for me and he said they made it with real pear drops! It was the most wonderful milkshake I’ve ever tasted in my life! I don’t even want to think about the calories it contained so I’m not going to! I haven’t been tracking my calories because we only had limited Internet and to be honest, it was lovely to leave the laptop alone for most of the week. When I weighed myself this morning, I was very pleased to only have a 2lb gain. I was aiming to stay the same but I can cope with 2lb. I’ve been on holidays before where I’ve put on half a stone in a week so I feel pretty good about the result this week. I’m now back to tracking and will here next week with a weight loss result! If you read my post last week after my trip to the doctor’s….Okay, so it’s not a tumor, you’ll know that I have to lose a lot of weight to be able to have an operation to sort out a hernia. I started my diet the same day I got the news about the hernia which was a week ago today. I’m using sparkpeople to help keep track of the calories I’m eating. It’s a free site and it really helps me to manage my food intake. It works out how many calories, carbs, fat and protein you should eat each day to have a healthy balanced diet. We go on holiday tomorrow so it’s going to be tough keeping track of the calories (no Internet in the apartment) but I’m determined not to over eat and undo all the hard work from this past week. I’ll add my photos to this post later when Aiden’s home from school because he has to take them for me! For those who have no idea what I’m talking about, here’s the back story…. A few weeks ago (maybe even a couple of months if I’m honest….I’ve been in denial for a while and no, I’m not really a poet!) I was taking a shower, as you do and I noticed that one side of my stomach was bigger and harder than the other side. I didn’t think much of it, preferring to forget all about it and hoping that it would go away. A few weeks later and it hadn’t gone away. I had a prod and a poke every time I had a shower and every time I thought to myself, I should just mention this to Ant and see what he reckons but by the time I’d finished my shower, I’d put it to the back of my mind again. However, the back of the mind can be a bit annoying. it doesn’t always keep things locked away there and I started to think that maybe it could be a tumor of some sort and the longer I deny it’s existence, the worse it could be getting so I finally decided to mention it to Ant last week. He was sensible and told me to make a doctors appointment, so I did. My doctor diagnosed a hernia and immediately I thought, ‘phew, it’s not a tumor; hernia’s aren’t so bad are they?’ he quickly changed my mind on that when he said “your weight and the fact that you’ve had blood clots on your lungs in the past means you’re too high risk for surgery. This means that you have to live with the hernia until you lose enough weight to be considered safe enough to operate on. Now, losing the weight might mean that it repairs itself and you won’t need surgery, which is what we’ll hope for. However, the hernia can get trapped at any time and if this happens, it will start to get painful. This can kill you. If you get any pain, see a doctor straight away”. He’s a really lovely doctor and I could see he felt awful telling me I had to lose weight. He said, “I know doctors blame weight on everything and you’re always being told to lose weight but this time, if we want to keep you alive, you have to lose the weight, there’s no other option because I know they’re not going to operate on you at this weight”. So I’m now on a new diet and fitness regime. I’ve been determined to lose the weight before but I’ve failed a lot of times. However, I’ve never felt like my life was in danger before, like I did when I got the blood clots on my lungs and was told I needed to stop smoking. I didn’t have another cig from that day and I’m now in the same frame of mind about my weight. I’m usually too shy to post full length pictures of myself online and always choose ones that I feel hide how big I actually am (they probably don’t but you know….denial is my friend) but I’ve decided that I need to face up to how I really look and I got Aiden to take these photos of me today. 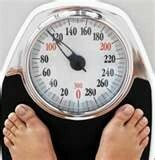 I weighed myself today. I’m the heaviest I’ve ever been and I’m ashamed I’ve let it get so bad. I’ve only ever been totally honest with Ant about how much I actually weigh but today I’m putting it out there because I’m determined to lose this weight and it will be really good for me to write about my journey and perhaps share it with others who are struggling with their weight. 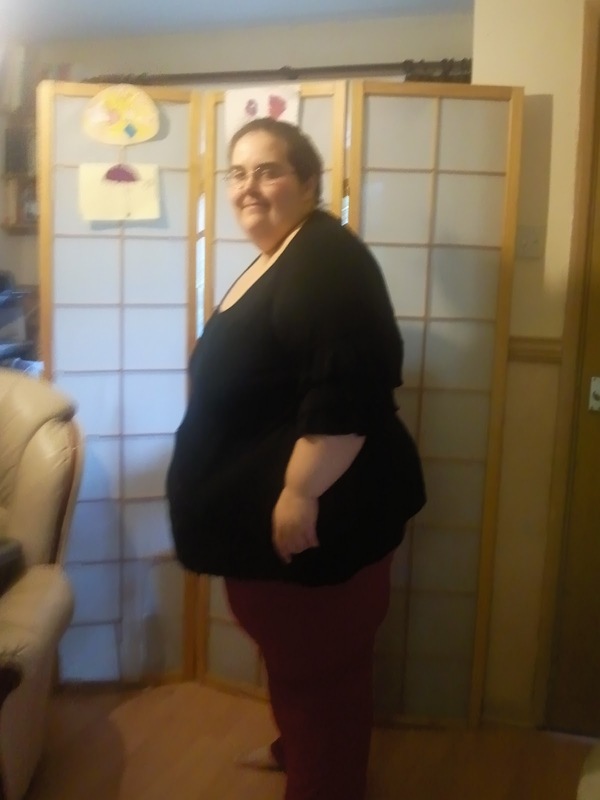 I’m going to post a new picture each week with my weight loss result. It will help me visualise the changes and hopefully keep me motivated. I’m going to use Sparkpeople to help me keep track of the calories and fat I eat. I’ve used it in the past and there are some great tools on there to help you get fitter. I really will appreciate any support I get so please feel free to leave a comment.